CKAPCO exists for fun. We do our best to have fun classes and trips and when it comes to trips, our Idaho river trips are my favorite. I have been doing them for 27 years and am as excited now as on the first one. This year we had sixteen folks along with us: one from CA, two from PA and the rest; DC Metro folks. I knew all but one from the start, but in no time at all, it was a big happy family. I've never had a better trip; never had such a great group. 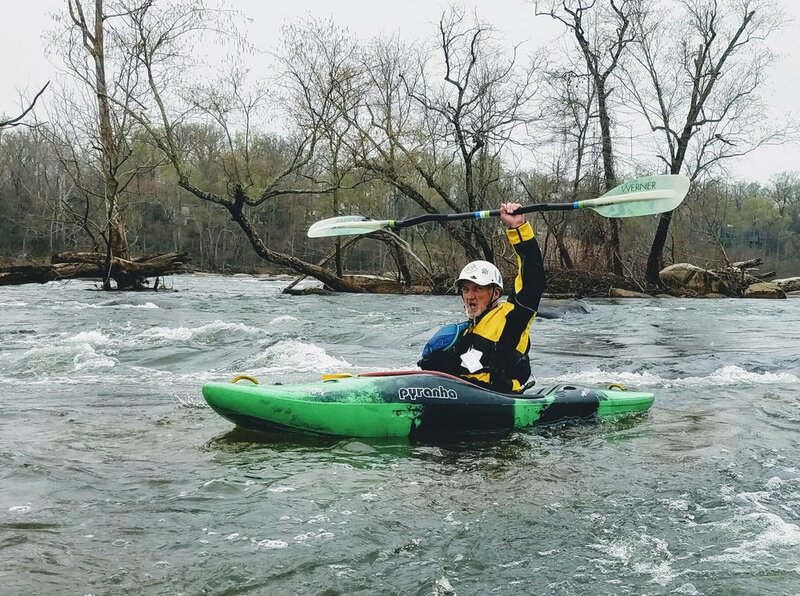 CKAPCO River and Coastal Kayaking Instructor Trainer Larry Ausley began his teaching season last weekend on the James River in Richmond, providing a whitewater kayaking skills polishing course. The level and the day were perfect for everyone to have a great time. FUN was the order of business. Check out Larry’s 2019 spring newsletter including training he already has scheduled for the upcoming year. Images courtesy Randi Kruger. We're chronic Facebook users and many of you are too. Don't miss a minute of goings-on in paddleland: Head over to Facebook and like our page there.